Papua New Guinea’s Foreign Minister, Hon. Rimbink Pato OBE LLB MP, has concluded wide-ranging discussions with his New Zealand Counterpart, Hon. Murray McCully MP, that will enhance APEC preparations, increase air travel and help expand renewable energy production in Papua New Guinea. Meeting in Auckland at the end of last week, the two Foreign Ministers agreed on the need to work together on preparations for both APEC Papua New Guinea 2018 and APEC New Zealand 2012. “Both of our countries are hosting APEC in the coming years so we have the opportunity to share experiences, and develop economies of scale when it comes to training our officials,” the Foreign Minister said. “New Zealand has offered to facilitate deeper training of our protocol personnel. “In 2018 we will have potentially 15,000 Leaders and delegates visiting pour country. “This will require training hundreds of our public servants across several departments to meet with and engage visitors from the 20 other APEC countries as well as our Pacific island nations. One of the other great benefits of hosting APEC is the contribution our country will make to shaping the APEC policy agenda on issues that matter to the region. “Oceans governance and the management of ocean resources is a concern that is important not only to Papua New Guinea and New Zealand, but to all Asia-Pacific nations. “New Zealand and Papua New Guinea share the same position that action on fisheries governance and management is need now, and we can advance this through the APEC agenda. “The conservation and management of ocean resources includes the matter of Fisheries Management and Sustainability. “This includes prevention of harmful subsidies, unregulated and unlicensed and illegal fishing in EEZs and territorial waters and the need for surveillance of the resource boundaries. “Both parties will look to particulars of how we can partner of this marine resources agenda. While the main focus of the meeting was on APEC preparations, the two Foreign Ministers also discussed the potential for direct aid links between New Zealand and Papua New Guinea. “The time is right to have direct flights between our countries. “There is a growing volume of trade and investment, but this is undermined by the indirect rout that must be taken to travel to Port Moresby from Wellington or Auckland. Foreign Minister Pato said he and his counterpart also discussed opportunities for advancing renewable energies in Papua New Guinea. “Papua New Guinea needs to undertake a better assessment of opportunities for various renewable energy technologies. “New Zealand will continue to work with us on advancing projects such as the hydro and market development and cooler systems for farmers in the Mamose Region all of which seemed to be progressing well. Foreign Minister Pato said Papua New Guinea truly appreciates the support the nation receives from Foreign Minister McCully and they will continue to grow their bilateral partnership. 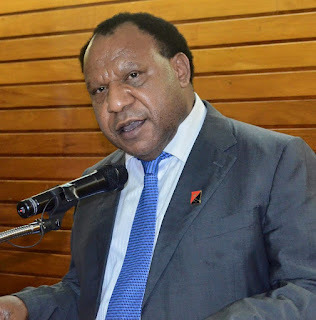 Finally, as part of PNG's ongoing commitment towards connecting in a globalizing world, Minister Pato announced PNG's readiness to assist and work with other PIF leaders and Japan under the PALM process. He also expressed support towards a proposal by the new Chair of the PIF, H.E President Christian of the FSM for a good air transport network in the region that would allow increased connectivity amongst Pacific countries either through an agreed Air Services Agreement that could allow Air Niugini or another airline in the Pacific for greater connectivity between countries in the Micronesian, Polynesian and Melanesian sub-regions together with Japan on a code sharing basis. Minister Pato joined other PIF members in thanking Prime Minister Abe again for the opportunity to meet and that he looks forward to the PALM Ministerial Review meeting in October 2016 which will be hosted by the Government of Japan.